Learn how to make a cute gemstone pendant with a wire wrapped finish. Take your chosen agate petal bead. Cut a length of your thicker wire measuring approx. 6" long. Mould it around the agate bead to make a curved shape at the base. Take a 1 metre length of the finer silver cord. Take your thicker wire in its moulded round shape and start wrapping with the thinner wire. Start on the left hand side near the bottom, around where you will want your first wire to go across the front of your agate pendant. Wrap down along the wire on the lowest curve where the bottom of your agate will sit. Continue until you have wrapped up the other side of the wire to the same point as where you started. Take your thin wire and thread it over to the other side, wrap once around the other side of thicker wire and thread back across again. Continue wrapping upwards on this side for another 5 wraps. Thread over to the other side and wrap up this side 5 times to mirror the side you just did. One side of your design will have diagonal wires, the front will have horizontal wires. The diagonal wires will be on the back of the pendant. Thread across again to make another part of the net to hold your agate pendant. 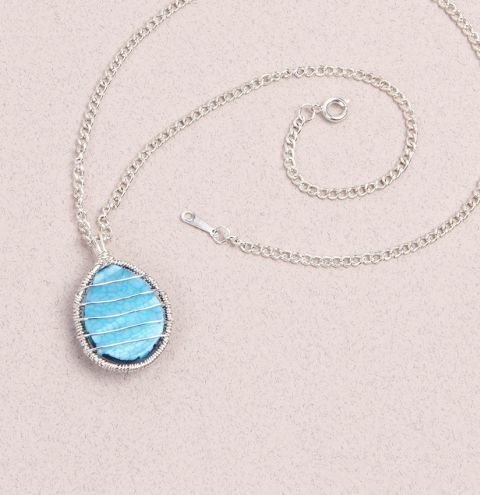 At this point, slot your agate pendant into the wire frame and adjust the thicker wire to fit around it better. Your will have 2 wires showing on each side. Continue the method of wrapping in sections up each side to encapsulate your agate pendant. Once you have wrapped up to the top, bring the two thicker wire ends together and wrap around both, tightly, 3/4 times to hold them together. Trim off the thin thread and flatten any sharp ends into the design. Take your two thicker wires coming out the top of your pendant. Trim these down to 1.5cm long. Gently bend them towards the front of the pendant and then create a loop by rolling the ends of the wire down towards the back and under to make a loop to thread onto your necklace.